Dr. Bernard Ray Hawke passed away on January 24, 2015 at Straub Hospital in Honolulu. Dr. Hawke, known as “Ray” to family and childhood friends and as “B. Ray” to most of his planetary science colleagues was a renowned lunar scientist, valued mentor, devoted brother and uncle, and cherished friend to many. He was born on October 22, 1946, in Louisville, Kentucky, grew up near Elizabethtown, Kentucky and attended public schools in that area. He participated in Future Farmers of America and 4-H activities. His 4-H leader worked for the U.S. Geological Survey. This sparked an interest in geology in young Ray and later led to a paid internship doing field mapping in central Kentucky. He also was inspired by President Kennedy’s speech calling for a manned Moon landing. Ray earned a B.S. in geology at the University of Kentucky. He then entered the Army and served with the 173rd Airborne Brigade and N Company, 75th Rangers in Vietnam during 1970 and ’71. After leaving the Army, he returned to the University of Kentucky where he earned his M.S. in Geology. He continued his geology studies at Brown University where he earned another M.S. and a Ph.D.
Dr. Hawke joined the small group of planetary geologists at the University of Hawaii in 1978. That group grew and later became part of the Hawaii Institute of Geophysics and Planetology. In 1983, he established the Pacific Regional Planetary Data Center, one of NASA’s Regional Planetary Image Facilities, and remained Director until his death. Dr. Hawke’s lunar geology interests included impact craters and volcanic deposits. He was a pioneer in advocating the use of the resources associated with pyroclastic deposits by future inhabitants of the Moon. His scientific studies involved active collaborations with colleagues in Hawaii and around the world, and their success was due to his generosity. He shared his ideas and knowledge and gave his time to help others. Dr. Hawke is survived by his brother Stephen, Stephen’s wife Nancie, and their children David and Michael of Columbia, Missouri. Remembering a valued collaborator and friend. I was saddened this weekend by the not totally unexpected news that lunar scientist and good friend B. Ray Hawke of the University of Hawaii has passed away. Colleague and collaborator, I knew B. Ray as long as almost anyone in the business. We were graduate students together, early co-workers and good friends. Bernard Ray Hawke hailed from Upton, Kentucky, about 60 miles north of my birthplace, Bowling Green, Kentucky. We first met in 1976 as graduate students at Brown University. A returning Vietnam veteran who’d served as an Airborne Ranger, B. Ray was a kindred spirit who helped me deal with the cultural shock as an Arizona State University student who’d exchanged the grand vistas of my adopted Arizona for the claustrophobic confines of Ivy League New England. We became good friends, spending hours at his preferred office – the local coffee shop (the IHOP, which advertised a “bottomless” coffee pot, a descriptor that B. Ray took literally). B. Ray’s scientific work focused very specifically on the Moon. As a Masters student at the University of Kentucky, he analyzed lunar regolith chemistry and used something called a “mixing model” to determine its geological affinities. In this technique, the composition of a soil is determined and that composition is modeled as a mixture of known components. Although seemingly an academic exercise, this approach could be a very powerful technique to decipher the geological history of the Apollo landing sites. Later, B. Ray and I would apply this same technique to chemical data returned by the orbiting Apollo spacecraft, giving us our first look at regional and global compositions. Combined with information about the geological setting of regions covered from orbit (such as the basin ejecta), such study would help us reconstruct the composition and makeup of the crust of the Moon. B. Ray’s early work dealt with integrating lunar sample information with images and geological mapping, my own field of specialization. He and I spent many hours discussing some of the problems of this effort, and also the issue of overcoming considerable community skepticism about the approach. We worked to convince our colleagues that the future of lunar science lay in the melding of the broad disciplines of sample science and remote sensing – taking results from the study of samples, using it to inform the interpretation of remote sensing data, and then concocting a geological model that explains and encompasses all known facts. Although this approach is now a recognized way to conduct lunar science, careful reading of the early literature will show that most early post-Apollo work was highly sequestered by discipline, with little cross-fertilization of results and insights. Because B. Ray and I found ourselves working on many of the same scientific problems after graduate school, we formed a partnership that lasted 40 years. One of our earliest efforts was an attempt to use impact basins as large-scale probes of the lunar crust. An early paper (1984) on the Orientale basin was the first to discover that massive blocks of pure anorthosite, an indigenous rock composed almost completely of plagioclase feldspar, make up the inner ring of that basin. In addition, we measured the composition of material thrown out from Orientale using chemical maps based on data from the orbiting Apollo spacecraft. These results indicated that the Orientale basin excavated only the upper portions of the lunar crust; new data from subsequent missions have confirmed these early results. The study of telescopic spectra, involving very precise measurements of color at high resolution of very small spots on the Moon, became B. Ray’s specialty. These spectra would be taken of many carefully selected geological targets, a great improvement over the previous approach of targeting mostly by geographic region. He spent many hours at Hawaii’s Mauna Kea Observatory, diligently working to make certain that data for the correct spot on the Moon was being acquired. His spectra were collected to address many scientific problems, including basin rings, dark halo craters, lunar “red spots” (spectrally anomalous regions), impact melt deposits and the ejecta of large craters and basins. B. Ray brought to these studies his extensive background in image analysis and interpretation. He had made geological maps of portions of the Moon, which for the first time could be interpreted in terms of mineral and chemical content. These studies are critical to our understanding of the complex and protracted geological evolution of the lunar crust. During his 35 year association with the University of Hawaii, B. Ray mentored and befriended many students and visiting scientists. I made an extended stay at UH early in 1980, and worked closely with B. Ray on using spectral interpretation to map the Apollo 16 landing site. B. Ray’s work habits were unorthodox to say the least, almost 180 degrees out of phase with normal working hours (I had to adjust to starting work at 9:00 pm and working until after breakfast). But for all that, I never saw anyone work so long and so hard when there was a problem to be solved. B. Ray was a great collaborator who very carefully reviewed each word in a paper, assuring that many errors and mistakes were corrected long before submittal. I could always count on a detailed and insightful review from him, even for papers for which he was not an author. As he passes into the annals of history, the world of lunar science is a bit poorer without B. Ray Hawke. He was a productive scientist, a hard worker, a tireless advocate for lunar activities and a good and faithful friend. His legacy leaves us with a new way of looking at the Moon – an integrated approach involving studies of samples, remote sensing data, and images. His contributions to lunar science include work on impact melts, Apollo 14 site geology, dark halo craters and the extent of ancient volcanism, lunar non-mare volcanism (KREEP and red spots), and geochemical anomalies of the lunar crust – an extensive and impressive amount of work. Thank you and rest easy, Dr. Hawke. Photo of B. Ray Hawke superposed on Consolidated Lunar Atlas full Moon image. 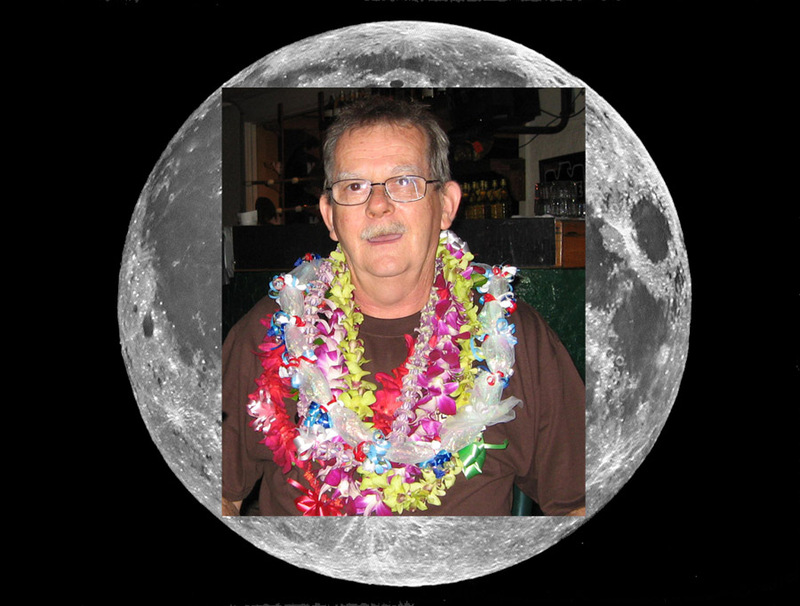 The Moon lost one of its best friends on Jan. 24, 2015, with the death of Dr. B. Ray Hawke of the University of Hawaii. He was a lunar geoscientist respected around the world. B. Ray Hawke was born and raised in Kentucky, and received a bachelor's degree in geology from the University of Kentucky. After returning from service an Airborne Ranger in Vietnam, he enrolled as a master's student at the University of Kentucky, working on chemical analysis of lunar samples. From there he moved to Brown University for doctoral work with Dr. Jim Head. At Brown he conducted geological studies using images returned by the Lunar Orbiter missions and by Apollo. One of his most-cited papers from this time dealt with impact melts on lunar crater rims. 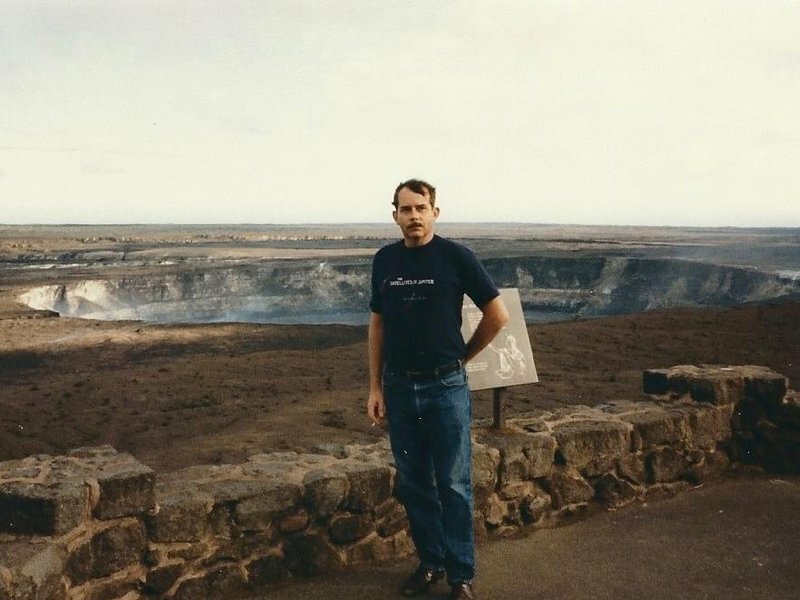 After obtaining his Ph.D., B. Ray moved to the University of Hawaii at Manoa, joining the research group in what is now the Hawaii Institute of Geophysics and Planetology (HIGP). Some of his early work in Hawaii involved analysis and interpretation of elemental chemistry maps derived from measurements by the Apollo orbital X-ray and gamma-ray spectrometers. Hawaii hosts one of the best astronomical observing sites on Earth: Mauna Kea. Hawaii Island is also a place where one of the most fundamental geological processes, volcanism, can be viewed in real time at Kilauea. The success of the HIGP group's research came from combining the tools of the astronomer (telescope instruments like spectrometers) with the perspective of the geologist in attempting to understand the nature and evolution of the Moon and other solid solar system bodies. B. Ray began to observe the Moon with the 24- and 88-inch telescopes on Mauna Kea, collecting reflectance spectra with spectrometers that had been specifically developed for planetary observing by Dr. Tom McCord and his colleagues. The real workhorse was the "infrared circular-variable-filter" spectrometer. This instrument precisely measured the intensity of light reflected from a spot on the lunar surface. By analyzing the reflectance variations in the tens to hundreds of wavelength channels contained in a spectrum, it is possible to determine type and abundance of key rock-forming minerals like olivine, pyroxene, and plagioclase. To collect this type of data, the telescope had to be guided by hand, with the observer using a joystick-like controller to keep the spectrometer's aperture on target while the instrument ran through the several-minute sequence to record a spectrum. The target, viewed as a flickering image on a low-resolution monitor, was a specific geological feature 5 or 10 kilometers in diameter – 385,000 km away on the lunar surface. B. Ray's detailed knowledge of lunar geography, aided by a trusty copy of the Rectified Lunar Atlas, helped to get the telescope's narrow field of view pointed at the right location. The Moon's motion and wind shaking the telescope meant that an observer needed a deft touch and great concentration to insure that useful data was collected. B. Ray was a master. B. Ray led a number of such observing runs from the late 1970s to the early 1990s, collecting data designed to attack a variety of problems in lunar geology. Topics included the nature of material exposed by major impact basins and the implications for the layering of the lunar crust, the discovery and importance of deposits of pure anorthosite, hidden deposits of mare basalt (later termed "cryptomaria") revealed by the presence of small impact craters with dark halos, the nature of crater rays, and the varieties of lunar explosive volcanic deposits (pyroclastics) and their importance for understanding the lunar interior and their potential utility as a lunar resource. In working with colleagues and graduate students at HIGP and collaborators at other institutions, B. Ray sought ways to integrate the telescopic spectra with other remote sensing datasets like Earth-based radar images and the Apollo orbital geochemistry maps, informed by his knowledge of the findings of lunar sample analysts. The 1990s brought a renaissance in lunar studies. This began as the Galileo spacecraft, on its way to Jupiter, flew past the Moon in 1990 and 1992 and returned the first modern digital multispectral images obtained from space that could be employed for compositional studies of the surface (including parts of the farside, not accessible to ground-based telescopes). Clementine conducted global mapping of the Moon in 1994, providing images in visible and near-infrared light, as well as topography measured by a laser altimeter. And in 1998-99, Lunar Prospector collected global data on the Moon's elemental composition with a neutron spectrometer and a gamma-ray spectrometer, as well as data on lunar magnetism and the charged particle environment. This bounty of data permitted a range of new studies, and new ways to extend previous work. B. Ray's work in this period focused on anorthosite, geochemical anomalies and cryptomaria. A new flood of lunar data began to arrive in 2007, with the launch of the Japanese SELENE (Kaguya) spacecraft. This was followed by China's Chang'e-1, India's Chandrayaan, Lunar Reconnaissance Orbiter, LCROSS, Chang'e-2, GRAIL, LADEE, and Chang'e-3. Selection as an LRO Participating Scientist gave B. Ray the opportunity to collaborate with an even greater number of lunar researchers. A whole new generation of younger scientists came to know the legendary B. Ray Hawke, and benefit from his knowledge and guidance. B. Ray was a southern gentleman who tried to be kind and polite to everyone. He always remembered colleagues and students with birthday and Christmas cards and gifts. He was extremely generous with his time - mentoring students, engaging in lengthy discussions at conference poster sessions, providing extensive constructive criticism on draft papers written by colleagues, and reviewing articles for science journals. He was famous for his impressive collection of NASA t-shirts, and for the blue denim jacket he would wear with a dress shirt and tie at science conferences. He loved southern home-style cooking, barbeque, Mexican food, and margaritas. Above all, B. Ray Hawke loved the study of the Moon. Some of us had the good fortune to study the Moon with him – and we all loved B. Ray. B.Ray was a wonderful mentor to me and a great friend. I will always remember his thorough reviews of my work and his strange expressions (which apparently weren't that strange to some people). I looked forward to seeing him at LPSC every year. His absence will be sorely missed. Rest in Peace, dear friend. Ray was a great scientist, a very generous person and an extraordinary colleague. We all will miss him dearly. We will be the poorer to be without B. Ray. He was an excellent scientist and a good person. Also, although he wasn't known as a great speaker, he gave what I always thought was the best opening line of any LPSC talk, ever. The chair introduced him, the lights went down, and B. Ray said, "As I was saying when the chairman interrupted me last year ..."
B. Ray's passing is a huge loss for the planetary science community. I am fortunate to have been able to call B. Ray a mentor, colleague, and friend. I will miss him dearly. B. Ray's encyclopedic knowledge of everything and anything to do with the Moon made him an excellent researcher and an invaluable resource, especially to those that he unselfishly mentored. B. Ray was one of the first planetary scientists I met, and we spent many many nights on Mauna Kea observing the Moon. B. Ray was a very good friend and I will miss him and his broad background and all the discussions I had with him. I first met B. Ray when I visited Brown because I had applied there as a grad student. He was nice to me then and supportive, and was one of the few people I knew at my first LPSC other than the people I came with. I also looked forward to visiting with him and saluting him at every LPSC. B. Ray was a real champion for the Network and one of my favorite RPIF Directors, as well as a very kindly and approachable soul. When I first met B. Ray, he was a grad student at Brown. Jim Head would send grad students B. Ray and Mark Cintala over to LPI to search for collection duplicates. A few years later, he went on to become the RPIF Director in Hawaii. He had amazing recall of small details involving dates, people, and places but also had great insight on controversial, political, or science issues. I will miss our chats at LPSC and the annual RPIF meeting. Not being a 'purebred' research scientist like most of you on this list, I never got to work with B. Ray on any projects. But, he was always very kind and eager to talk to me, and mentor me, on anything having to do with future exploration of the Moon. His eyes would especially light up if I asked about lava tubes for habitation or pyroclastic deposits for ISRU. He was especially helpful to me during the Constellation days when we were compiling regions of interest to focus on with LROC during the first year of operations. I'll miss his blue jean jacket. B. Ray is unique. I can’t bear to use the past tense. He is a ‘true-blue’ lunar geologist whose depth and breadth of knowledge, attention to detail, commitment, and generosity with colleagues are examples of the best qualities that give our community strength and continuity. I don't actually know if B Ray liked beer as other geologists, but do know his favorite hangout at Brown was the I-Hop which never closed and had bottomless cups of coffee. Can’t you hear his “Hrruumph” (quiet clearing of his throat) before giving his perspective and insight about ongoing issues of lunar science? B. Ray's generosity extends not only to professional colleagues but also to admiring onlookers. He is never too busy to stop and explain a scientific concept to me, an engineer. As we buckle down for a big snowstorm here on the east coast, I'm reminded of the time B. Ray called me on my cell phone (how did he get the number? I don't know!) a few years ago at about 8:00 am EST. I was just heading outside to clear out about 24 inches of fresh powder from my driveway when he called to talk about Hansteen Alpha and said "This'll just take a few minutes." A solid 45 minutes later I was still sitting in my warm home office listening to B. Ray expound on this very interesting lunar feature. I'd welcome similar relief tomorrow morning! Not being a “purebred” lunar scientist (but a “different-bred” nuclear scientist), I am very appreciative of B. Ray’s enthusiasm to reach out to various folks in the lunar community, like myself, and selflessly enter into various kinds of research projects. LPSC won¹t be the same without him. B. Ray was a colleague and friend who made it possible for me to spend some time at the Hawaii Institute of Geophysics and Planetology which resulted in several publications. More than that, he was a unique voice in the community, and thus can't be replaced. May he be in a place where he can explore the universe without any physical or political limitations, the planetary scientist's heaven. B. Ray, Mark Cintala and I were grad students at Brown in the late 70s. Even then the center of his life was the Moon. His personal life was subsumed to his lunar studies, and his work habits (48 hrs or more straight, fueled by endless coffee, and then crash for a day) meant that no one could keep up. But it was never a competition, he always freely shared his knowledgeable and wisdom, especially with grad students. B. Ray and I were on the opposite sides of the universe politically but we could joke and kid about the differences without ever becoming rancorous. I always looked forward to the lunch that we and his ex-students would share at LPSC over many years - this March I hope we will do so again, with B. Ray the focus of the stories rather than the chief raconteur. I did a post-doc at U. Hawaii years ago and took a course in lunar geology from B. Ray. As the years went by, one part of LPSC that I would always look forward to was a warm reunion with B. Ray and his colleagues. B. Ray offered enthusiasm and expertise about the Moon in a way that brought out the fun of doing science. I agree that LPSC won’t be the same without B. Ray. I first met B. Ray at an LPSC meeting long ago. He caught me at the poster session and explained his research topic, cryptomare at that time, with a bottle of beer. To be honest, it was a little bit difficult for me to understand what he was saying because his accent was waving. Yes, I miss him with his accent. About 20 years ago, I read Coombs and Hawke “A search for intact lava tubes on the Moon Possible lunar base habitats.”(1992). Then the search for intact lava tubes by our exploration became one of my purposes. In 2009, I had a chance to stay in U. Hawaii as a guest researcher. There, I could report the discovery of large holes/pits, possible skylights of underlying caverns on the Moon, to B. Ray and could tell him my thanks directly “Our work was highly motivated by your work.” He often came to my room. I discussed lots of scientific topics with him. Thank you B. Ray. Just last week I was reading Hawke B. R. & Head J. W., 1977, Pre-Imbrian history of the Fra Mauro region and Apollo 14 sample provenance, PLSC8. It won't be long before B. Ray and Graham are sharing Kentucky bourbon and English tea, getting it all figured out, and laughing at the rest of us because it's all just so damn obvious. Miss you B. Ray. I knew Ray was going to make a great impact on the world as far back as the 1950's. My brother Larry and I would visit him and his family that lived close to Sonora after church on some Sundays to play. He was interested in rockets and space even then at a very young age. I lost track of him after graduation from high school and did not know he served his country during the Vietnam war like many of us did. May God receive you Ray in eternity and you will get to see the true vastness of the Universe you so loved.